In the summer of 2013 I stumbled across a necklace that I could only describe as a long rectangular sheet of gold metal with a huge dent causing the metal to distort. It seems inconspicuous for some but for me I thought it was wonderfully sculptural, artistic and minimalist. From then on it became one of my newest favourite jewellery brands. So I was especially delighted when Noritamy were being showcased in one of the designer showrooms during London Fashion Week. It was an opportunity to see the collections up close and better still, to try their beautiful pieces on. The first thing that caught my utmost attention was this vast, meteoric gold-shard ring with a single diamond in the centre, which has wowed me beyond words. With its rough organic textured surface and jagged yet smooth edges it looked like something you would find tumbling down from the outer space. Another huge favourite of mine was the fingerless black leather glove ring that dramatically transforms an outfit, creating a darker, edgier and cool look. Of course, it would not be a complete trip without trying on the rectangular gold plated dented necklace (one day...). Noritamy was founded in 2009 and came into prominence almost immediately with their one of a kind collections. 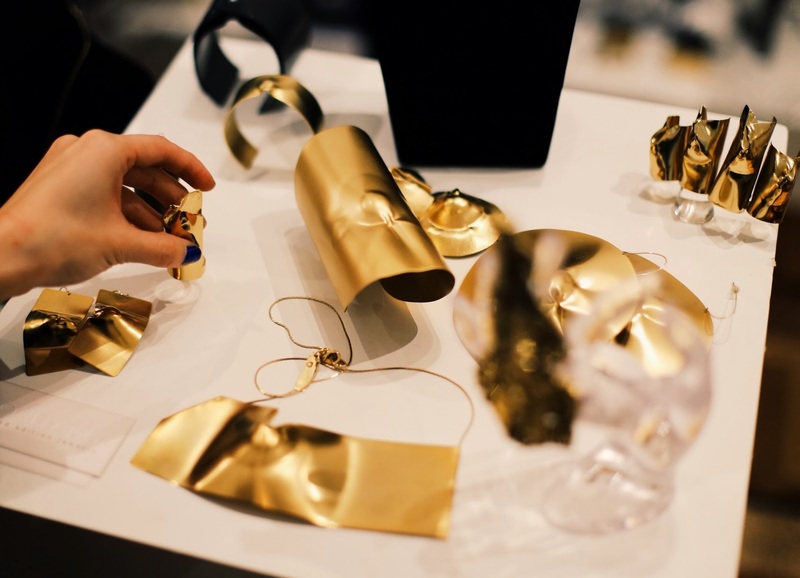 Designed by jeweller Tammar Edelman and Architect Elinor Envi, there is a fascinating encounter between jewellery and architecture, seamlessly combining the two trades together in a dramatically sophisticated yet classic way. Their pieces does command attention when worn, but then you would not have it in any other way.